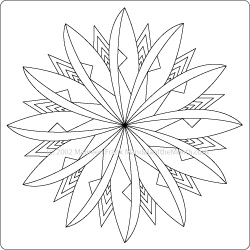 I originally sketched out this mandala in 2002. It lay dormant until it caught my eye while going through my sketches yesterday looking for a design for the September MotM. Even just as a line drawing it has a three dimensional look about it, waiting patiently for a gust of wind to start it moving again. Sometimes we feel like that. We’ve done all that we think we can and we wait patiently (or impatiently) for something to happen, for a gust of wind to move our sails. So why wait for something or someone to make things happen for us? Often times what we’re waiting for is something that may (and will) never happen: waiting for things to be perfect. FTS! I’m going to (do this) once (this happens) . “Windmill” encourages us to re-think this strategy because all these things are just fear disguised as convenient excuses. If you really want to act, then act even if it’s in your living room. If you truly want to travel, then start by traveling to places near you that you have yet to visit. If you truly want an organized garage, then start with creating a “5-minute” plan of action (a list of tasks that could be done in 5 minutes)…or make it a 10 or 15-minute action plan. “Windmill” tells us that if we truly, in our heart of hearts, want to “do this“, then do it! There is always some action we can take, regardless of how small, to move it forward. And it could be that all we need do is change the direction of our sails (a different perspective) to create the momentum. What one thing can I do today to put the the wind in my sails?